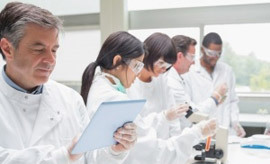 The implantation of the Inverse Chromatography technique in the customer Lab is sometimes more relevant than measurements on request. Therefore, we also propose solutions that allow you to perform yourself the wished Inverse Chromatography measurements. The instruments are chosen in agreement with the customers and theirs needs. In other words, the kind of measurement and sample to analyse, as well as the type of detector, the number of analytical channels are taken into account. Our implantation solutions can also be adapted to existing instruments. We have developed three Inverse Chromatography software programs. Each of them is devoted to one of the Inverse Chromatography techniques: IGC-ID, IGC-FC and ILC. Each software is coupled to a Data Acquisition System included in our offer. The software programs updates are free during the first 5 years. Previously to each implantation, a measurement protocol based on one or two samples furnished by the customer is developed in our lab. The samples were also measured following this protocol. The training (2 days) is carried out in the customer’s lab on the purchased solution. It consists in applying the developed protocol in order to reproduce on the same samples, the measurements previously done in our lab. We also support you free of charge within the first 3 months after the training, if you have any question concerning the use of the instrument, of the software or the interpretation of the results. Scientific support is thought to help you in different situations like: the development of new analysis protocols, the confirmation of your measurement results, the interpretation of your results. Depending on your needs, the solution we propose is a combination of several of these four components. For any further information, please contact us.